Established in 1994 in Sydney Australia, Bortz Product Design has worked on a diverse range of successful industrial design projects for Australian and international clients. Using the latest technologies in CAD and rapid prototyping, we provide an efficient and effective way for our clients to make better informed decisions; about product features, marketing potential and costing. Our design process can be seamlessly linked with manufacturing to provide quicker lead times. At the core of our design culture we thrive on producing innovative, cost effective designs that could be be patent-able, have minimal part count, good material selection and minimal assembly resulting in good sustainable design solutions. We value good communication, reliability, integrity and meeting or exceeding expectations and deadlines and strive to provide these to our clients. "I have been using Bortz Product Design for over 10 years now. Gary has designed and helped improve over 30 products for us over the years. His input and design has been invaluable to our business. I would highly recommend Bortz Product Design." "Having a close relationship with our Sydney based industrial design house, Bortz Product Design, frees us up to focus on the sales and manufacturing processes for our hose reels, and hence compresses our development and production time. With the aid of 3D CAD, being able to see our reels fitting together accurately provides reassurance we are on the right track in new product development. We are the Australian specialists in custom made hose reels and therefore we often require new designs entailing very specific customer requirements. The fast turnaround from Gary and his deep understanding of our product allows us to manufacture completely custom made reels to tight deadlines, resulting in a solid, durable, beautifully designed product – and satisfied customers." I've worked with several great designers over 30 years and Gary is one of the best. He was highly recommend by an associate and we've done about half a dozen designs since then. All have been stress free, on time and cost effective. An added bonus for us was Gary's ability to refer us to a new high quality yet 'best price' fabricator when our normal supplier couldn't meet an urgent deadline ... Five stars thank you Gary! "In your field of industrial design - you are "simply the best". "Excellent service, speedy and reliable. We had no idea how the design process works and Bortz Product Design explained everything carefully and we felt safe. They were the only company we approached who managed to figure out how to have our design as single part. I was very impressed with your "out of the box" thinking. We look forward to our next industrial design project with you. 10 out of 10, thanks." Highly regarded as an essential member of our team, we are privileged to work with Gary Bortz of Bortz Product Design. His contribution is outstanding as is his professionalism. Gary’s innate talents and abilities as an industrial designer, exceeded only by his humble, proactive and innovative approach to his commissions, ensured that our concepts were developed through to realisation. He has been instrumental with the successful development and design for manufacture of our unique products, providing us an immense market advantage. Added to his unique creative perspectives and experience across the spectrum of planning, product design, and development management are his link to our worthy and exceptional Chinese manufacturer of plastic injection mouldings and toolmaking. Included in Gary’s body of work is also the packaging of our products. ​Profoundly understanding Gary Bortz has significantly turned our vision to reality and problems into solutions. We anticipate a continual and successful collaboration with Bortz Product Design. "The staff at Bortz Product Design are professional, helpful and approachable, with a great deal of experience and knowledge in industrial design. The design process, from consultation to implementation, was painless, running smoothly without a hitch. Orbit Communications highly recommends Bortz Product Design to any company considering outsourcing their product design. "I have used BPD on numerous occasions for electronics based projects over the last 7 years. Gary has proven to be very professional, efficient, creative and a pleasure to deal with. On one particular project, it was amazing what he achieved to get all the electronics to fit inside an enclosure in a compact and efficient way. I have no hesitation recommending BPD." I have worked with Gary for many years and found him to be efficient and easy to work with in getting new design bottles done that deliver for my customers. I would recommend him on bottle design and he is particularly good on tight timelines when required. 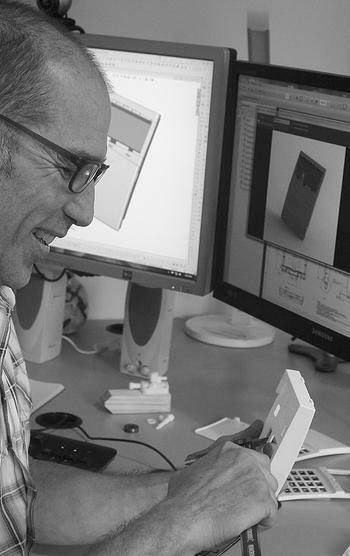 Gary Bortz, Principal Designer and Director of Bortz Product Design Pty Ltd is an Accredited Designer and Fellow of the Design Institute of Australia. He is also a SolidWorks Certified Professional, Advanced Surfacing Specialist and DriveWorksXpress Certified Associate that is the author of a number of patents.